Clueless in the wine aisle? Winc eliminates the guesswork surrounding wine by providing personalized recommendations based on your unique palette preferences. Wine is one of life’s simple pleasures. Winc believes that the experience of getting a great bottle of wine should be as simple as enjoying one. Winc creates and curates over a hundred wines, and makes the experience of exploring wine easy and pleasurable—So you can spend more time enjoying the wine in your glass. Discover new favorites right from your front door. Discover wine personalized to your palate today! Get Started Today With $22 Off Your First Order of $52 or more! Pricing for Winc wines starts at $13 per wine bottle. Get started with order as low as $30 for 4 bottles of wine (i.e. with $22 discount on total $52 value)! This promotion is an instant rebate credit applied to your shopping cart. All promotions and wine purchases require a 4 bottle minimum. No Winc promo codes or coupon codes are needed. The Promotional discount will be automatically activated upon clicking on above link. Promotions cannot be combined, are not applicable to gift purchases, may apply to featured wines available to new members. Shipping credits do not apply to overnight shipping. The site uses an algorithm to provide customers with personalized wine recommendations based on their taste preferences and purchasing histories. Club W identifies as a global direct-to-consumer winery. Each wine comes with a tasting video, food pairing suggestions, and a wine card with a recipe pairing and information on the varietal, winemaker, and region. Their portfolio of wines includes “grape-to-glass” wine made by their own vineyards or in partnership with a range of small-lot producers. All the wines are curated and sourced from WINC. As a direct-to-consumer winery, Winc works directly with vineyards and winemakers all over the world. The wines are curated and sourced from WINC. 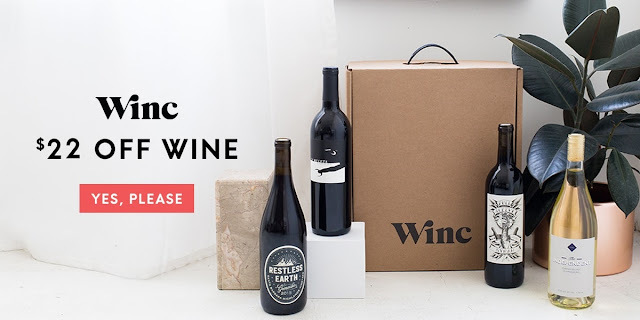 The cost for a Winc Monthly Experience starts at three bottles of wine for $39 per month. Plus you can save $22 off this order when you use our exclusive Winc promo code. Winc also allows users to cancel or skip a shipment at any time, as well as to return any wines disliked. Bottles are priced between $13 and $20. In order to "handle your request promptly" and because they are "passionate about improving every aspect of the customer experience," it is only possible to cancel a membership by speaking with one of their representatives in person during their PST weekday hours. In 2015, Club W partnered with nonprofit organization charity: water to fund clean water projects for global populations in need. As part of the partnership, the club agreed to donate five dollars to the organization for the purchase of each bottle of the charity: water x Club W Red Blend. Winc discount code will be automatically applied at the checkout. We love Winc wines and we are sure you will love it too. Like our Unofficial Facebook Fan Page for Winc offers.